Unveiled alongside the Lamborghini Urus ST-X Concept is this, the Lamborghini SC18 – a one-off build by the Italian automaker’s motorsport division, Lamborghini Squadra Corse. Unlike the track-only SUV, the SC18 is homologated for road use, but designed primarily for track purposes. 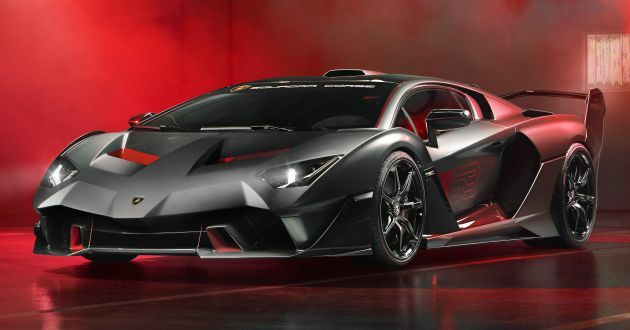 It’s based on an existing Aventador, but designed in synergy with the customer and Centro Stile Lamborghini. The SC18 paves the way for further personalised development projects for motorsport customers under the Squadra Corse brand, so if you’re a regular at the tracks, this should tickle your fancy. Immediately noticeable is the car’s more extreme aerodynamics. 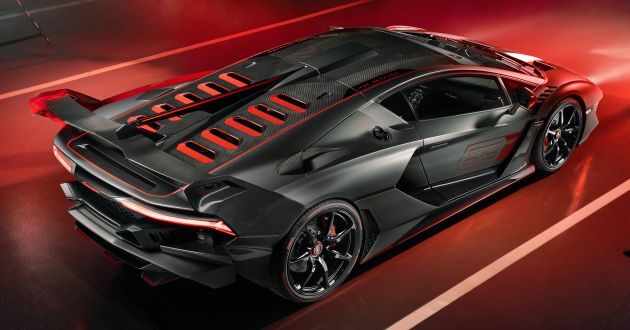 The front bonnet features huge air intakes in the style of the Huracán GT3 EVO, whereas the sides and rear feature fins, fenders and air scoops that are inspired by the Huracán Super Trofeo EVO. Additionally, the rear end gets the customary carbon-fibre wing with three built-in mechanical adjustments, which generate the required level of downforce at any speed and on any circuit. The tail lights are brand new, spanning the width of the tail but broken in the centre where the badge sits, like with the Terzo Millennio concept. As for the engine cover, the car has a dozen (yes, 12!) air vents to improve heat exchange and help cool the V12 motor. Speaking of which, the SC18 is powered by Sant’Agata’s top-of-the-line 6.5 litre naturally-aspirated V12 engine, delivering 770 hp at 8,500 rpm and 720 Nm of torque at 6,750 rpm (same as Aventador SVJ). Power is put down to the ground via an ISR-optimised (Independent Shifting Rod) seven-speed gearbox and all-wheel-drive system. To complete the package, a special exhaust system has been fitted for that unmistakable Lamborghini sound. Considering its racey purposes, the car features ultra lightweight materials for weight reduction, and the body is made of carbon-fibre. The blacked-out, single-nut wheels measure 20-inch up front and 21-inch at the back, shod with specially-developed Pirelli P Zero Corsa tyres. A special telemetry system has also been fitted to measure all performance aspects on the track. The bespoke road-legal race car is finished in Grigio Daytona with red highlights, whereas the cockpit features black Nero Ade Alcantara with cross-stitching in red Rosso All and carbon-fibre sports seats. It sits 109 mm above the ground, which makes for an incredible show of speed even at standstill.